Although ENT is a surgical specialty, not all ear, nose and throat conditions are treated with surgical interventions. Conservative treatment protocols are always considered. However, when ENT conditions are left untreated and become chronic, many of our senses – hearing, tasting, and smelling – can become seriously impaired. Our goal is restore your child to good health and to provide best-in-care practices for long term health and well-being. The ENT physicians, staff and audiologists are family-centered. We know these conditions affect the entire family and we have programs that provide ongoing care, education and support throughout your child’s life. 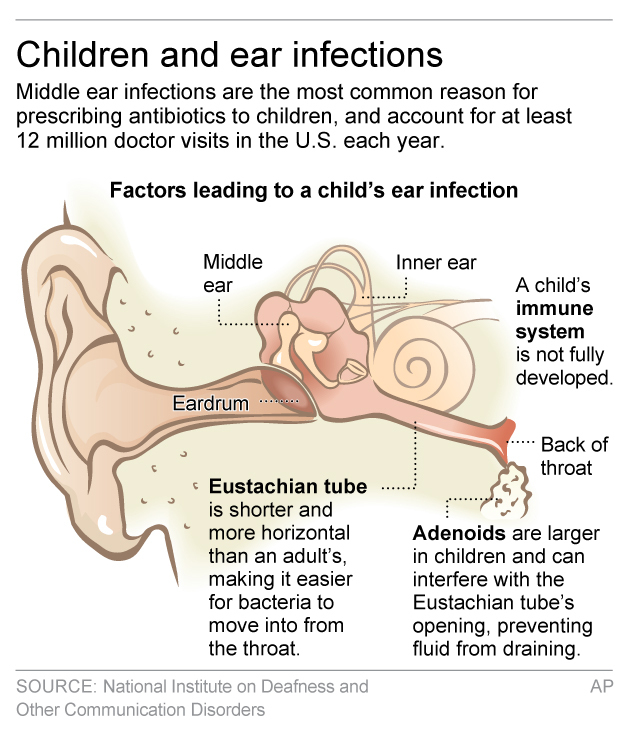 Ear infections are the number one reason a child visits a physician. If your child has three or more ear infections in six months or four or more in a year consult an ENT specialist. Ear infections and hearing loss are related. We provide comprehensive hearing testing, interventions and resources for children of all ages, including infants and their families. We are very experienced in ear tubes, minimally invasive and complex ear surgeries. We utilize the most up-to-date hearing aid technologies: digital hearing aids, bone anchoring hearing aids (BAHA), and cochlear implants. To learn more about the Pediatric Audiology services click here. Tonsillitis/Obstructive Sleep Apnea are one of the most common chronic illnesses in children. Tonsils and adenoids are the body’s first line of defense against infection. Sometimes chronically inflamed tonsils and adenoids can actually cause an airway obstruction or become the site of repeated bacterial infections. Noisy breathing throughout the day and night is a symptom that should be shared with your physician. Allergies are associated with ear, nose and throat problems. Over one third of ENT diagnoses are related to an underlying allergy. If one parent has allergies, there is a 40% chance the child will have allergies; if two parents, then the risk increases to 70%. Managing allergies and sinus problems can prevent serious ear, nose and throat conditions. The otolaryngologists will coordinate other testing and treatments with allergy specialists. Chronic bloody nose – be sure to tell the ENT physician about any falls or trauma to the face, especially to the nose during contact sports and playground play. The ENT physicians and Audiologists are consistently on the front lines, developing higher standards of care, especially for the child with complex, multi-disciplinary medical needs. Pediatric Aerodigestive/ Dysphagia Program – This program is for the child with breathing and swallowing difficulties. We are part of a team that includes GI, Pulmonary Medicine, Speech Therapy and Pathology along with other specialized team members who meet bi-monthly to discuss the next steps in these patients’ treatment plans. Some children have difficulties with liquids, or different food textures, even saliva. Sometimes the foods or liquids are swallowed incorrectly and enter the airway. At evaluation we ask about the patient’s history, look at posture, eating behaviors and the strength and movement of the muscles involved in swallowing. In some children an endoscopic procedure is used to evaluate the swallowing muscles, in other cases, an operative evaluation may be needed. The treatment plan will be personalized to the child and his or her growth and development and may include specific dietary modifications, exercises, and other therapies that stimulate maximum swallowing, speech and vocal function. Pediatric drug-induced Sleep Endoscopy (DISE) – This procedure is done in conjunction with our PMCH Sleep Disorders Specialist and is used to evaluate the child’s airway at rest and deep sleep. The anesthesia used mimics the resting muscle tone of sleep in the patient. A telescope goes down into the throat so that the physicians can visualize and evaluate possible sites of breathing obstructions. If a straight-forward surgical intervention is indicated to alleviate the obstruction, this procedure can be done at the same time the DISE procedure is done, if insurance allows.